More adventures out with my friend who was visiting Brisbane. I've mentioned before I try to get out as often as I can with the two boys, but with my friend here we've been doing a more than our usual routine of library and playgroup visits. I've been reaching for jeans a lot to keep things simple, and Converse for all the walking. Wore this for a trip to Australia zoo. While it was quite warm and I took my cardigan off for most of the day, I was thankful I'd brought the scarf as it's a great breastfeeding coverup. Plus the bird print is perfect for a day at the zoo. Didn't attract the local birds like I did last time I wore it though! The elephant necklace was a last minute addition but again was a fun animal themed piece to wear to the zoo. I have a few teething necklaces from when toddler T was a baby, this one is a new one I got in a babyology subscription box. Baby boy has started grabbing and tugging on my hair hard so the necklace was a little bit of a distraction for him. Came in handy on the long car ride home when we got stuck in traffic with a cranky baby too, one of my friends tied it to the baby capsule like a little mobile to calm him down. Last worn: Ray-Ban Wayfarer, grey cardi, bird print scarf, breastfeeding tank, skinny jeans, Converse, Rebecca Minkoff saddle bag. Other ways to wear: grey cardi and a maxi skirt, bird print scarf and stripes, breastfeeding tank and maxi skirt, skinny jeans and a floral kimono, Converse and flares, two different ways to wear a saddle bag. It was a slightly cooler day so I was glad I'd worn a thicker cardigan. While I took the scarf off and on as I was babywearing with the Ergo carrier, the cardigan stayed on all day as we went into the city for brunch. It's getting more fun to eat out with toddler T as he's getting to the age where we can order a little meal for him to, and he definitely enjoyed his little serving. I've mentioned before that I wasn't too sure about what kind of printed scarves I could wear with these jeans, but I find skull scarves seem to go with everything and I don't worry about wearing them with other prints. It was nice to have a little more red in my outfit too. Last worn: Ray-Ban Wayfarer (above), black cardigan, red skull scarf, grey tee, printed skinny jeans, Converse, Rebecca Minkoff saddle bag (above). Other ways to wear: black cardigan with cobalt tee, red skull scarf and striped cardi, grey tee and maternity pencil skirt, printed skinny jeans and purple, Converse and spring dresses, Rebecca Minkoff saddle bag and flares. Linking up with What I Wore, Fresh Fashion, Oh Hey Girl, Fashion Files, Throwback Thursday, Fabulous Friday, Fun Fashion, Weekend Linkup, Flashback Fashion, Weekend Wear, Passion For Fashion, Friday Faves. As always you've got a nice scarf and it suits the bag too. This bag is pretty, a feminine version of Valentino. It was too perfect, had to be worn, haha! Absolutely LOVE both of these outfits! You have such a gorgeous scarf collection! That necklace is adorable!! Love that it serves a dual purpose, hehe! hahahah, love the elephant necklace addition!! Such a cute bag!! 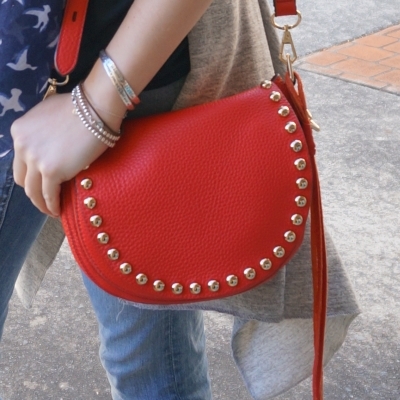 I love the red and studs! Something I'm totally doing next time around is the teething necklaces. Actually, before reading your blog, I had no idea they even existed! Back when Penny was a little thing, she loved to thug at my hair. Wish I would have had one of those! Who would have thought that a skull print would be a neutral?? I love it! I appreciate that you're making an effort to be dressed nicely when you're out and about, Mica! Well done! I know it must be tough with two little ones, but you're looking fabulous. Haha yes two steps forward, one step back! Won't be long until they are both sitting and eating in high chairs next to us! Both looks are fun, and how fun to be out and about with your boys--I'm sure they love it. 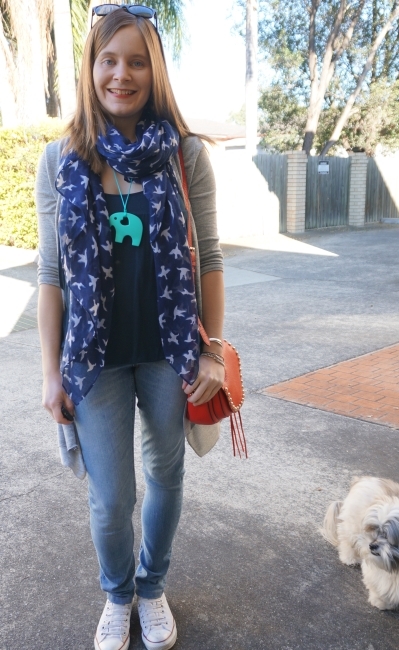 LOVE that adorable elephant necklace, and also the mix of the printed jeans + skull scarf. It gives your look some edge, I love it! It's always nice to be able to get out more when friends are in town visiting! Your outfit for the zoo was really cute and the elephant necklace gave it a fun and colorful ouch! I love the first outfit! It is something that I would wear out myself, simple but still very stylish and I'm really loving that bird printed scarf. Sounds like you had a great time at the zoo with your friend. Gorgeous!! I love both looks!! The blue scarf is too cute! Really love that first outfit! I'm a sucker for dark blue and teal together. And love your use of scarves in both outfits. It sounds like you've been having some fun filled days lately! We really have! It's good to have a routine, but nice to change it up too. 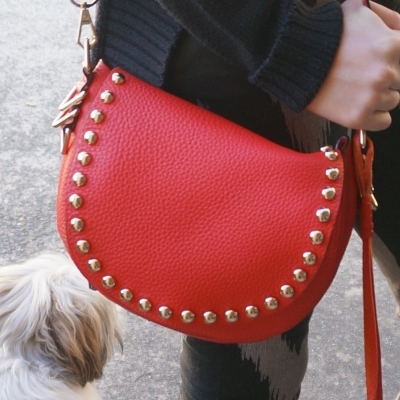 That red saddle bag is just adorable! I love the bright color and the pop of color it adds! Jeans and sneakers are always good for exploring, and with your fun accessories the outfit looks so pulled together. It sounds like you had an eventful day, girlie! I'm sure the kids loved seeing all the animals at the zoo and how clever of your friend to think of using that super cute necklace as a little mobile to calm the little guy! You look beautiful in both outfits, I'm loving the way you've been working with those chevron printed jeans. They can be touch to pull off, but you've been working them so well! Thanks so much for sharing, beauty, and I hope you're having a great week so far! I really love your bird scarf! Converses are so practical, aren't they?! I wear mine all the time! Love the teething necklace. I didn’t know they were a thing but it must be so much more useful! My son always used to rip & chew my gold necklaces so I could never wear them. Love the scarves. They kind of elevate the outfit a little. Such a cute scarf! I love it! I used to have a dress in similar bird print to your scarf but it wore out - I still miss it, such a fun and cute print. It is a fun print, shame about your dress though. I love that blue & grey outfit. I always think those two colors are so pretty. They compliment everyone. Also love the star scarf and animal necklace. Reminds me of animal cookies :) Glad you to had a great time at the zoo. I need to visit mine. Love that teething necklace - so cute! I wished they had teething necklaces when my son was little, they are so fun! You wear the sneakers so well. Teething necklaces are such a great idea.